Bug bites are fairly common problems. If you spend any amount of time outdoors or camping, you have most likely had an insect sting or a bug bite at some point. 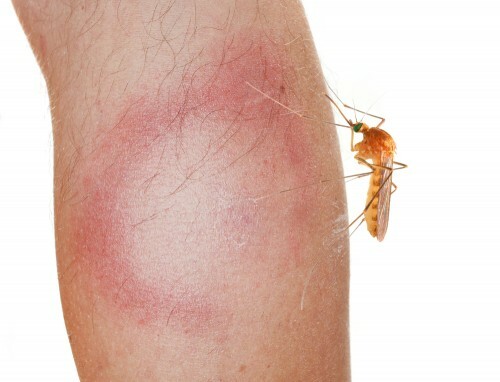 Most of the time, you can easily tell if you have a mosquito bite or a tick bite. These bite marks are caused by the insect feeding or defending itself. While most bites will heal on their own, they can last longer if you are extremely sensitive to them. If you see a bug bite with a white ring around it, you may be worried about what it could mean. Depending on the cause, it could be due to a number of different things. If you experience signs of an allergic reaction, make sure to get medical help to make sure that you do not go into anaphylactic shock. When the skin tissue dies, it causes something known as skin necrosis. The white ring around your bug bite is filled with dead lymphocytes. These are the white blood cells in your body that died as they rushed to the bite to kill the toxic chemicals that came from the sting or bite. When you are looking at a bug bite with a white ring around it, it is important to see if it is from the necrotic venom or caused by a secondary infection. Any biting insect can cause a reaction to occur on your skin. It can create an itchy bump or welt that last for anywhere from a few hours to several days. Depending on the type of bite, it can cause an ulcer or wound on the skin that causes a white ring of tissue around the bite. This can also occur when a disease or infection is transmitted through the bite. While this can happen with mosquitoes or ticks, it is especially common with spider bites. This bite can cause ulcerations and severe itching. Unfortunately, ticks can also spread Lyme disease. Ticks can become infected with a microorganism known as a spirochete. When they bite you, they inject this microorganism into your skin. Once you are infected with Lyme disease, you can cause symptoms like the flu. It can cause a chronic infection. 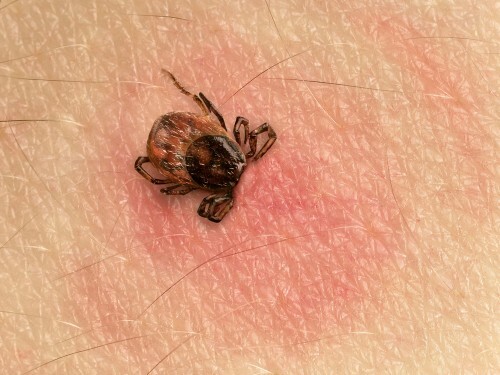 The tick bite may look like a welt surrounded by red rings that radiate away from the bite like a bull’s eye. Mosquito bites are extremely common. The mosquito bites your skin to feed on the blood. Afterward, you develop an itchy bump that typically heals within a few days. Unfortunately, mosquitoes can also carry infections and parasites like the Zika virus, malaria or yellow fever. While spider bites are less common than mosquito bites, they can still happen. They can be painful and cause a bump. Sometimes, they cause a secondary infection where a white ring made of dead skin cells is created around the open sore. Some people say that a bite surrounding by a white ring is a sign of a brown recluse spider bite because the spider injects a necrotic venom that causes the skin to die. If this is the case, then the would will eventually ulcerate into a bigger wound that has a central blister and a red ring surrounded by a white ring. A spider bite can cause symptoms like a fever, nausea, a rash or vomiting. Burning, pain, itching or redness can start within a few hours or days. The area around the right may look purple or deep blue in color. It may be surrounded by red and white rings. You may also develop a blister or ulcer that turns black. Scorpions can cause extremely painful stings, but they are generally harmless. There are only a few species that cause fatalities. The stings are the most dangerous when they happen to young children or the elderly. Bees, hornets and wasps can cause two different reactions when they sting. The first and most common reaction is caused by the venom. This can cause pain in the affected area, redness and swelling at the sting site. While the pain is intense at first, it typically goes away within a few hours. The second reaction happens if you are allergic to the sting. If you are allergic and do not get immediate medical care, it can cause you to go into anaphylactic shock and even die. Fire ants can cause extremely painful bites. These stings can cause an ulcer to develop at the sting site and circular-shaped, white or red rings. While most people only suffer from the pain, the stings can also cause potentially life-threatening reactions as well. Individuals with a fire ant sting may develop redness, itching, swelling, nausea, trouble breathing, burning or vomiting. You may also suffer from fainting, hives, dizziness or hives. If you are having a serious reaction, you pulse may become rapid and weak. For insect bites, individuals can generally treat them at home. For a black widow or brown recluse spider bite, seek out immediate medical treatment. A black widow bite requires an antivenom treatment so that you will not die. For a brown recluse spider bite, the doctor will use Dapsone to prevent the necrotic lesions from spreading. With insect stings, it is important to figure out which inspect caused it. If you have a scorpion sting, it is important to seek emergency treatment to make sure your breathing, heart rate and blood pressure remain normal. Your doctor may also need to monitor you for anaphylactic shock. If it does not cause an ulcer, elevating the bite, avoiding movement of the bite and a cold pack can help treat it. If the bite causes an ulcer as well as necrosis, it is generally treated by removing the dead skin. If you experience symptoms like nausea, intense pain, irregular heartbeats, loss of consciousness, difficulty breathing, chills, fever, abdominal pain or intense stiffness, seek immediate medical attention. You should also get immediate medical care if you suffer from rapid swelling of the lips, eyes, throat and tongue.